LOST REDUCED – Watch it here! The celebrated comedy theatre troupe have condensed all five seasons into a fast paced flight through the story of the Oceanic plane crash survivors. The world premiere is to be held in London on Thursday 28th January, performed for an intimate audience of competition winners. The production will also be filmed for internet broadcast as well as on the Sky Platform’s Anytime service. “Yeah, sure they will,” grumbled Martin. Martin and Tichenor are managing partners of the Reduced Shakespeare Company and will perform Lost Reduced with long-time company member Matt Rippy. Co-creator and executive producer Damon Lindelof and executive producer Carlton Cuse have praised the idea and granted permission for the production to go ahead. Tickets will be given away to fans through a series of online competitions and radio promotions. If you didn’t win tickets through the RSC’s guessing game on Twitter, there’s still a chance. Email your name, contact number and the email address of your plus one to [email protected]. 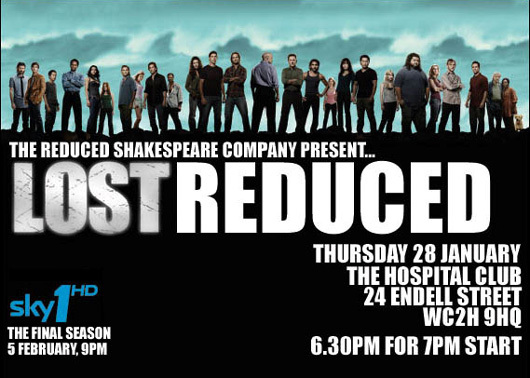 LOST REDUCED is written and performed by the Reduced Shakespeare Company with the project overseen by Sophie Jones and Brothers and Sisters Creative for Sky1. The final season of LOST launches on Sky1 HD and Sky1 on Friday 5th February at 9pm. TICKETS to LOST →← JANUARY NEWSLETTER: Out Now!